Bottled as an exclusive winemaker offering, this white wine blend is comprised of varietals truly unique to their origins. Available exclusively through the winery or the Lake Sonoma Winery Wine Club. Pinot Blanc from the esteemed Russian River Valley offers floral aromatics and crisp citrus flavors with bright acidity. Chardonnay, also from the Russian River Valley, provides structure, full body and richness. A glass full of tropical aromas, including candied pineapple and orange blossoms. The palate has lush melon throughout your sip with a touch of vanilla on the finish. 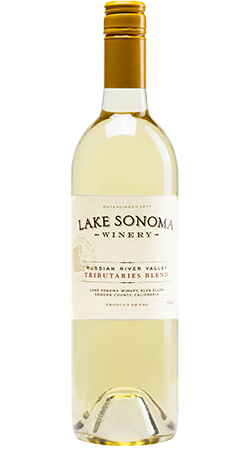 The Tributaries Blend is an easy summer drinker when you want something in between a Sauv Blanc and a Chardonnay. It’s sure to please fans of both.